Accurately track employee shifts, breaks and work hours. Most trusted customized employee timesheet management software solution. A complete data-entry and timesheet management HR Outsourcing offering. With PurelyTracking, businesses have seen a massive rise in employee productivity and accurate payroll generation. Businesses are using our Web, iPad and Mobile application to empower employees and managers to work better, smarter and faster! PurelyTracking is the best free workforce management solution for businesses aiming to streamline task management, job costing and payroll. Perfect for employees working in-and-out of office. Geo-lock feature ensures accurate data for employee shift, breaks and daily time cards. Check-In and Check-Out with a single click via PurelyTracking Mobile App. Easiest software solution to accurately maintain weekly and monthly timesheet submissions. Employees and Managers can check current and past timesheets. Segregated entries for different projects. Employees have control over their time clock and timesheet submissions. Our Leave Management feature lets employee apply for leaves through online portals. In-built Task management and for streamlining daily work. Accurate job costing through daily Time Clock and monthly Timesheet submissions. Project Managers can easily track job cost per resource by analyzing timesheets. Eliminate human errors by automating job costing for accurate payroll. A 360 degree solution for everything from Timesheet to Payroll management. Error-free data entry services double checked by account manager every month. 24x7 customer care support for via email, live chat & skype. Streamline workforce management by exporting reports and analyzing key employee data. ADP, QuickBooks and Paychex integration for Invoice and Payroll generation. Easy-to-access automated reports for better business decisions. Our Web and Mobile Time Clock and Timesheet solution makes tracking employee shifts, breaks and time approvals easier than ever! Auto-calculate job costing and enable employee self-services with in-built features such as Employee Leave Management, Invoice and Payroll Integration. 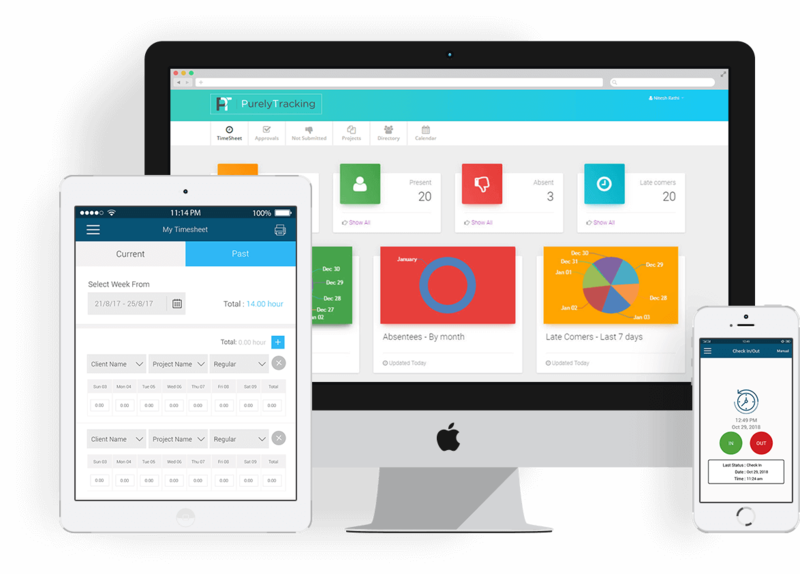 The most impressive thing is that PurelyTracking is the only completely FREE Time Clock App and Workforce management system!